Whether charged with a traffic or criminal offense, or involved in a contentious landlord-tenant matter, the Huntington Law Firm of Meaney & Meaney PC are passionate advocates for your rights. Our attorneys are well-versed in criminal and civil law and we pride ourselves on aggressively representing your interests to achieve the fastest, most favorable result possible. We represent clients in all of Suffolk and Nassau counties, as well as the boroughs of New York City. We use our experience and knowledge of the law to help you understand your options, so that you can make the right decisions for your specific situation. We offer free consultations and will keep you updated throughout the duration of your legal issue. Our attorneys also handle a variety of real estate transactions. Buying or selling your home or commercial real property represents a significant investment of time, money and energy. We will guide you through the entire process from the start to finish, including handling title searches and title insurance, helping you understand the possible expenses and taxes of your transaction, negotiating the purchase/sale agreements and representing your interests at closing. In addition to criminal defense and landlord tenant matters, real estate law, foreclosure defense and loan modifications, we handle bankruptcies, contract drafting, credit card/debt settlement and civil litigation. 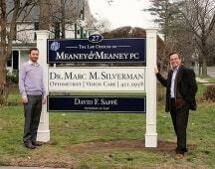 At the Huntington Law Firm of Meaney & Meaney PC, it’s not just business, it’s family. Founded by attorney brothers, Andrew and James Meaney, we appreciate how important your legal matter is to you, and our law firm is dedicated to helping you find the right solution for you and your family.